Wednesday’s Boston Globe featured the conclusion of an unusual editorial-page series called Service Not Included. 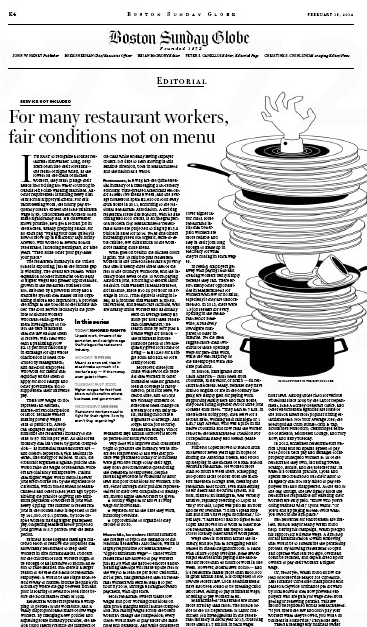 For four days the Globe’s editorials have been exclusively dedicated the plight of restaurant-industry employees. The full-page kickoff appeared in the Boston Sunday Globe. Because waiters making poverty wages turn to public aid, American taxpayers effectively subsidize the restaurant industry to the tune of $7 billion per year. From there, Monday’s editorial addressed the tipping system, Tuesday’s took on the living wage, and yesterday’s addressed the need for advocacy and activism. All in all, an admirable effort that didn’t get the attention it richly deserved. This entry was posted on Thursday, February 20th, 2014 at 9:56 am and is filed under Uncategorized. You can follow any responses to this entry through the RSS 2.0 feed. You can leave a response, or trackback from your own site.